Galuh Tajimalela, “The Last Meeting Presentation”. Ronald Manullang, “In the morning of 28 March 1830”. 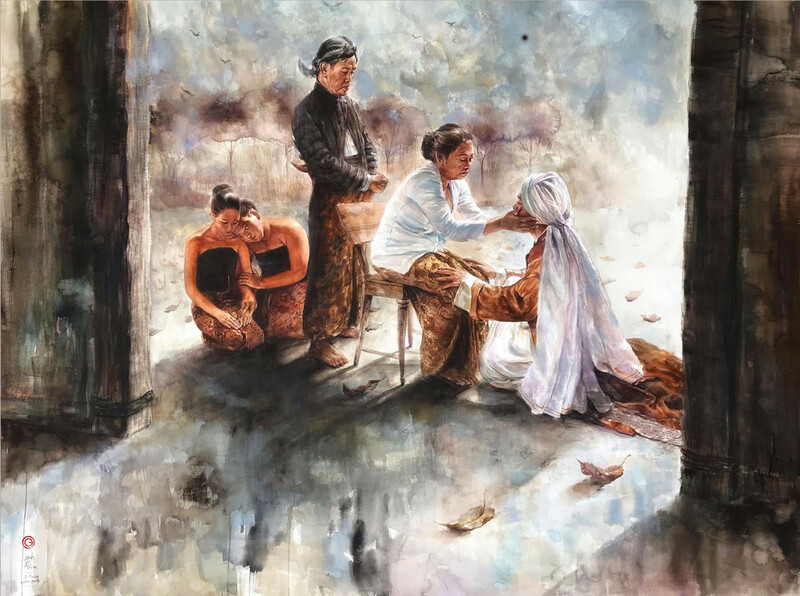 The Jogja Gallery in Yogyakarta held a special exposition of works of 50 artists with the theme “The Life Episodes of National Hero Diponegoro” from Feb. 1 to 14. The curator of the exhibition was Dr. Mikke Susanto. 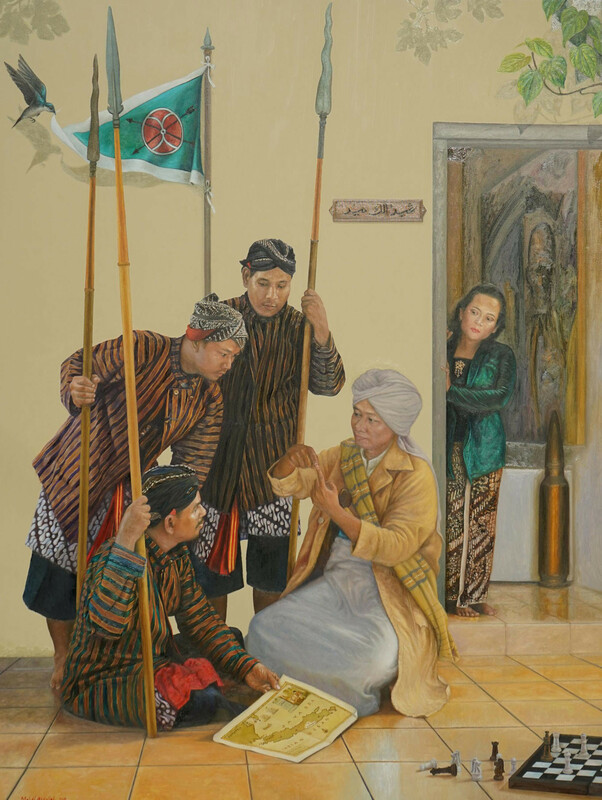 In November last year, artists were invited to produce scenes of the life of Pangeran Diponegoro, taken from Babad Diponegoro (Autobiography of Diponegoro). The organizers did not only promote the work of painters, but was also aiming to raise the public’s historical awareness of the prince. Diponegoro was a prince from the Court of Yogya who took up arms against the Dutch colonial government. The insurrection lasted five years from 1825 to 1830, which was the biggest, longest and costliest war during the colonial period. More than 200,000 people were killed out of a population of 2 million and the Dutch lost 8,000 soldiers and 7,000 mercenaries. The war cost 25 million Dutch guilders which depleted the treasury. But through forced plantation fees imposed on the farmers in Java, known as the cultuur stelsel, the Dutch from 1831 to 1877, gained a profit of more than 832 million guilders (US$70 billion in current terms) which contributed to the vast infrastructure development of Holland in the 19th century. During the nationalist movement, Diponegoro was a symbol of resistance, used by schools and the country’s founding father, Sukarno, in the nationalist movement. In 1967 then-president Sukarno proclaimed Diponegoro a national hero. Nearly every big city has streets named after Diponegoro. The Indonesian Military (TNI) command headquarters in Central Java is also named afterhim, as well as a state university in Semarang, also in Central Java. The highest international recognition for the prince came in 2013, when UNESCO registered his autobiography -- written while in exile in Manado in 1830 and 1831 -- in the Register of Memory of the World. After the recognition from UNESCO, more publication and performances commemorated Diponegoro, which made him better known to the public. Books were written, as well as monologues by Landung Simatupang, and a play by Remy Silado. These followed in the footsteps of Sardono who in the 1980s produced a Diponegoro ballet. The rising interest in Diponegoro was also reflected at the Jogja Gallery’s Diponegoro exhibition in February. The exhibition attracted 9,000 visitors -- a high number considering the exhibition was held in Yogyakarta. But the most surprising fact is that nearly half of the paintings were bought by the public, which surprised the organizers and the artists. Four paintings fetched over Rp 100 million ($7,047). The gallery is housed in an old building in the northwest corner of the big Alun-Alun (town square), not far from Keraton. Although the building is not big, the exhibition halls are roomy and exhibited 51 paintings with ease. The paintings represented a variety of styles, mostly naturalism and symbolism, while several painters showed abstract styles. 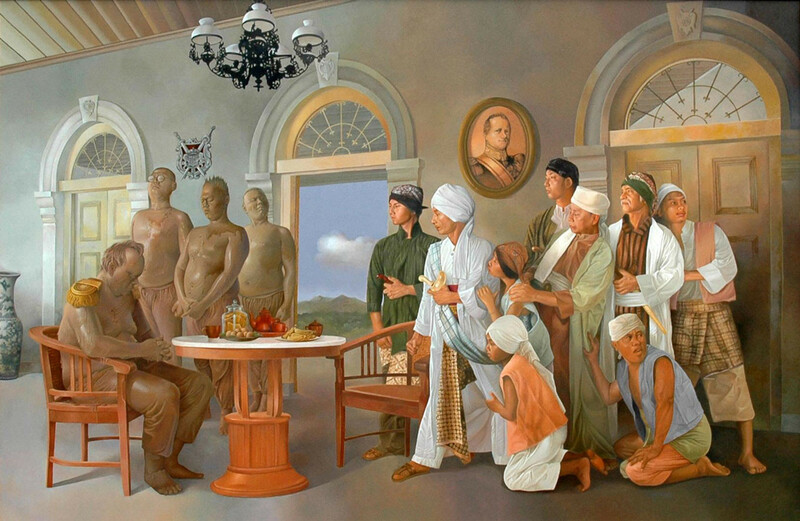 Ronald Manullang’s painting “In the Morning of 28 March 1830 in Magelang” impressed at once, by the simplicity of its composition: the prince sitting in the middle, a woman next to him sitting on the floor, and two Dutch officers standing left and right. The painting looks like a modern family photograph, which Ronald is famous for. Although it should represent the scene of a treacherous meeting by the Dutch, it looks more like a family gathering. 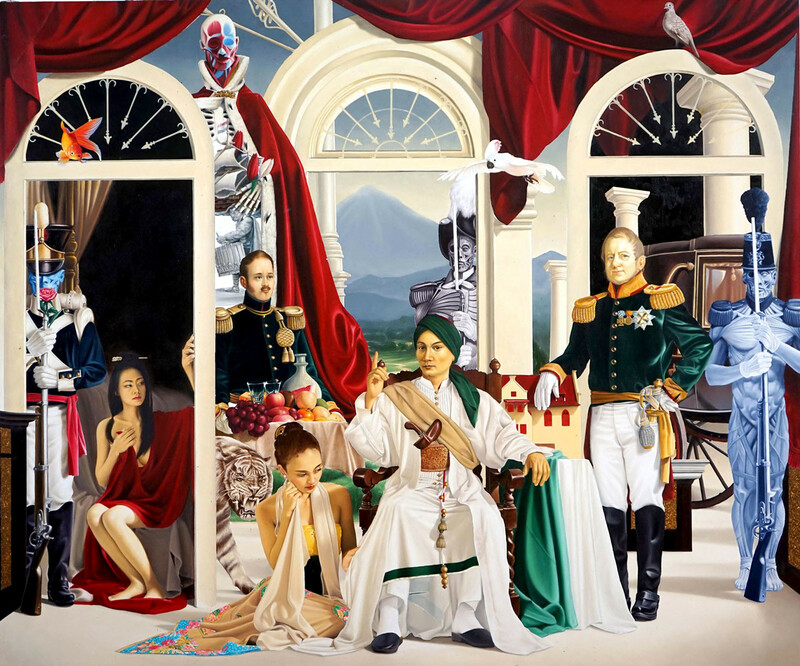 The message of despair and treachery is so subtle, Diponegoro sitting in the middle pointing a finger, looking abstract but resigned, the woman mourning on the floor, and the Dutch general with a small satisfying smile. The painting fetched the highest price. The five paintings, which fetched the highest prices, represented realistic naturalism, reflecting the taste and the preference of the public for naturalistic-style paintings. It is interesting to note that 22 paintings out of the 51 exhibited were sold. That the name Diponegoro had a big influence on the decision of the buyers is in no doubt. The big interest in the paintings could be ascribed to their good quality and the rise of connoisseurs who appreciate good art and are willing to buy them. This should be good news to the art world in general, because a good public/audience is the prerequisite for success in the creative industry. The painting industry has enjoyed robust response from supporters since the 1980s, in line with the booming economy. The writer is a former minister of education and culture.